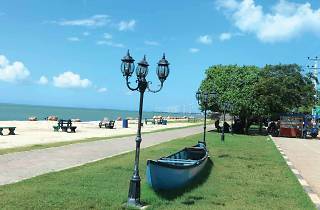 Puttalam is a unique costal town with a tradition and legacy of its own. It may not be prominently carved in history’s rock and limestones; but Puttalam has a past that it proudly nurtures. Yet, Puttalam lives and breathes in the present, vibrant in the invigorating air that gushes from its expansive Indian Ocean coastline. It is located 133km from Colombo where the west coast rail track ends and the unmarked northern frontier begins. 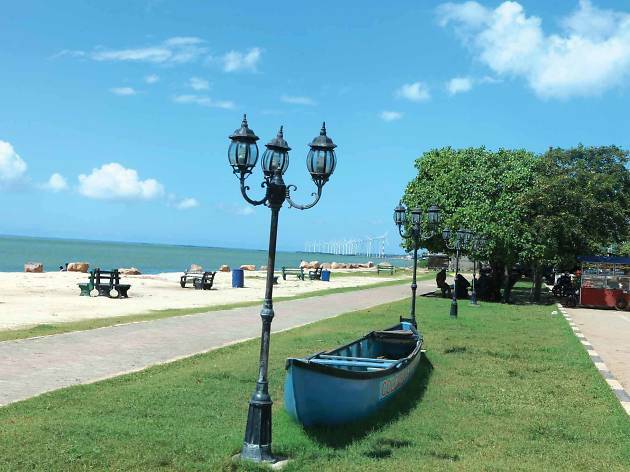 Puttalam is on the inland side of the lagoon that begins at Kalpitiya, extending down to Udduppi and reaching up to Vanathavilluwa, which forms a lagoon line of 70km. Once a forgotten town of fish and salt, it has transformed itself into a throbbing hub of activity with industries indispensable to the country. The lagoon provides a succulent bounty, making Puttalam crabs and Puttalam prawns brand names. Much in demand in the country, they fetch fancy prices in Colombo’s seafood restaurants and occupy top billing on the gastronomic menu. 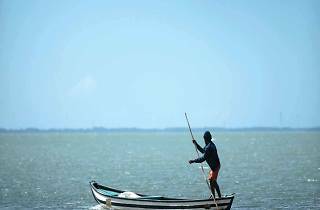 Each morning small fishing boats bring their catch of the day to Puttalam’s fish market, where restaurateurs purchase the best. Not just fresh fish but also sun dried fish aka ‘dried-fish’ are made here, in a number of small karawala wadiyas along the lagoon belt. Here fish are cleaned, sliced and then placed on coir nets on the ground and left to be dried into a salty delicacy that can be stored for a long time. 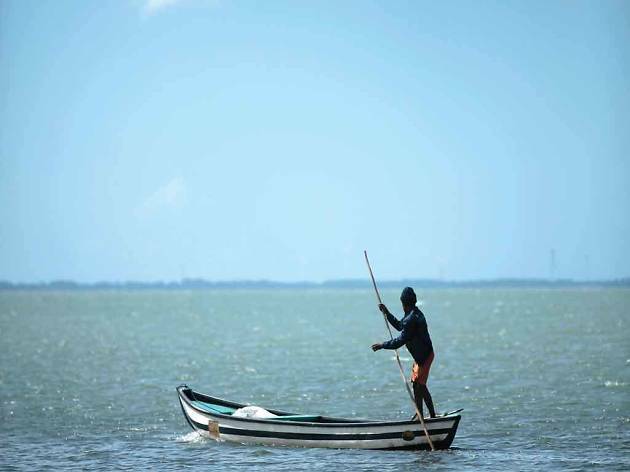 Two kilometres from Puttalam on the Mannar Road, is the salt lake of Thammenna, covering an area of 1,200 acres inclusive of two reservoirs, which comprise 560 acres. On the border of the salterns and the lagoon, is a new giant in town, commandeering its skyline are giant steel towers standing like silent sentinels of the land, facing the sea to capture a new source of energy. These are the modern windmills, changing their rotor blade faces at the wind’s will to harness wind power. These 800-kilowatt wind turbines, currently 25 in number, are situated in wind farms approximately 3.5km in length and are found on both sides of the lagoon belt. Being 60m in height, they can be seen from many a spot in the peninsula. In keeping its place in the country’s Coconut Triangle, the roads are flanked by large coconut plantations, which have made Puttalam the second largest producer of coconut in the country. Moving towards the Kalpitiya road is the famous church in Talawila, dedicated to St. Anne. The church, which is more than 250 years old, is one of the country’s most popular Roman Catholic shrines and thousands of Catholics throng the hallowed grounds each year, especially during the feasts held in March and August. At the end of the Kalpitiya road is the Old Dutch Fort built at the start of the 18th Century to protect trade and commerce. Its walls are 2.28m wide and 2.43m high. What makes Puttalam so vibrant is that all three major communities, Sinhala, Tamil and Muslim people live in the district, making it a tapestry of interwoven social relationships and human coexistence. Puttlam town has a significant population of Muslims and bordering the lagoon is their large Mohiddeen Jumma Mosque, which is supposedly over 150 years old. And finally there is Puttalam’s unofficial mascot, the famous Puttalam buruwa (donkey). The strong animal was used to transport bags of salt from Puttalam to the kingdom of Kurunegala. Today they roam the streets and bazaars of a throbbing locality with not a care in the world.